Over the weekend there were many storms throughout the midwest. Many people were without power throughout the evening. 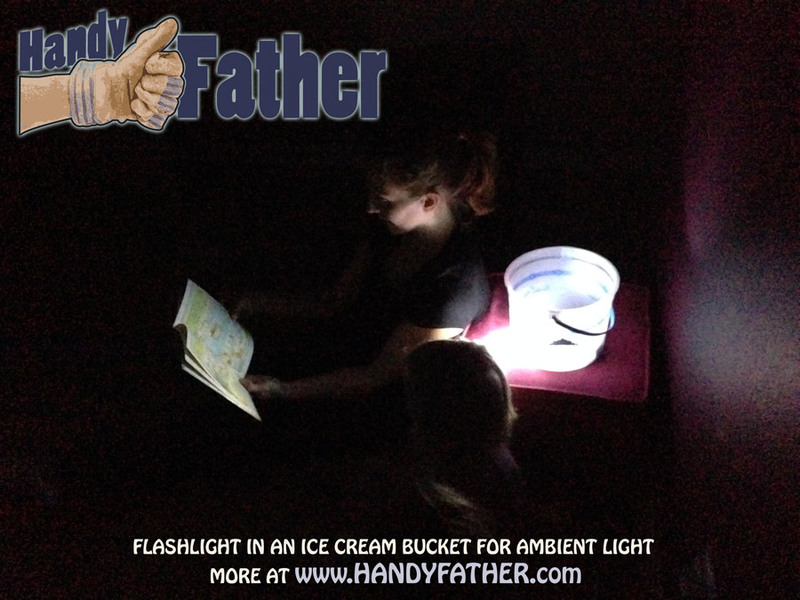 If you find yourself in need of more light than a small flashlight can provide, Handy Father has an easy lighting solution for power outage that is so easy, anyone can do it! Sure, there are candles, but a Handy Father will not leave lit candles in children’s rooms at bedtime. What we have is a small Cheap LED Flashlights . It runs on a couple AAA batteries. By itself, it will illuminate a small area, but not much else. We needed more ambient light than this simple flashlight would provide. The lighting solution is simple. Get yourself an empty ice cream bucket (one of the 5-quart size works best. 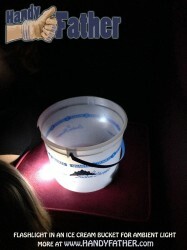 Put the LED flashlight into the bucket, turned on, into the bucket with the lit end as far from the sidewall as possible. The light from the flashlight will create a lot of ambient light as it refracts and makes the entire ice cream bucket glow. We read the kids a bedtime story at night, and this easy lighting solution for power outage came in quite handy. We were able to read and get the kids ready for bed with hands-free lighting, and without the dangers associated with open flames in rambunctious kid’s bedrooms. Battery powered Radio or cellphone to receive important public announcements. great idea. Now to get that bucket empty!